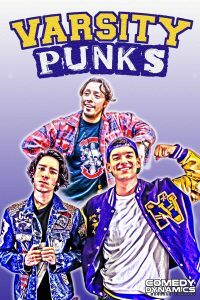 Comedy Dynamics has acquired the comedic drama, Varsity Punks, which will be released by Comedy Dynamics on February 26, 2019 and will be available on iTunes, Google Play, Amazon, Microsoft Xbox, Vimeo and Steam. Varisty Punks follows the story of AJ Montoya, a star high school quarterback who suffers a serious injury and is forced to team up with his longtime rivals, the cross-country team. This group of misfits band together to achieve the holy grail of any teenager, high school glory. The film was the directorial debut for writer and director, Anthony Solorzano. Varsity Punksstars Efran Ramirez (Napoleon Dynamite, Crank: High Voltage, Casa de Mi Padre), Cody Esquivel (Rebel, Distortion, Teen Wolf), Reka Rene (The Row, Outlaws and Angels, The Prey) and Noel Gugliemi (The Fast and The Furious, Training Day, Gamer). KCET recently called the film “A universally appealing coming of age story about belonging and identity in high school”. “Varsity Punks is a true coming to age film that reminds us why high school was some of the absolute best and potentially worst times of our lives.” said Brian Volk-Weiss, CEO of Comedy Dynamics. This film was negotiated on behalf of Comedy Dynamics by Anna Roberts. Founded by Brian Volk-Weiss, Comedy Dynamics, a Nacelle company, is the largest independent comedy production and distribution company, producing Netflix’sKevin Hart’s Guide to Black History, Netflix’s The Toys That Made Us, Jim Gaffigan: Noble Ape, The CW’s Discontinued, Animal Planet’s Animal Nation with Anthony Anderson, the scripted comedy on Hulu, There’s… Johnny!, History’s Join Or Die with Craig Ferguson, MTV2’s Wild ’N On Tour, and Hulu’s Coming To The Stage. In 2018, Comedy Dynamics began releasing original films in theaters starting with the acclaimed documentary, Poop Talk. The company has worked with a wide range of established and emerging comedic talent including Tiffany Haddish, Kevin Hart, Aziz Ansari, Jim Gaffigan, Ali Wong and many more. 17 Comedy Dynamics’ releases have been Grammy-nominated, including all 5 in the Comedy Album category for the 61stAnnual Grammy Awards.